A Classic Thoughtful Way To say I am thinking of you!!! Our Teddy Delight bouquet contains ten Blue Iris, six Yellow Sweetheart Roses, Solidaster, and comes with a 5" Teddy Bear in one of four shades of brown. This bouquet is wrapped in decorative cellophane and carefully hand packed on ice in an attractive, fully insulated gift box, and shipped via Overnight Courier. A personalized card, floral preservative packets and rose care information are also included. 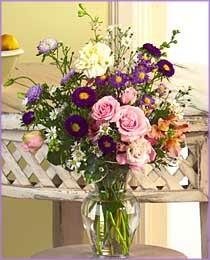 Show her you care with our Sweet Sentiments bouquet. This exquisite bouquet contains three White Lilies, six Pink Roses, three Iris and three Yellow Mini Carnations accented with Filler Greens. Your selection is wrapped in decorative cellophane and carefully hand packed on ice in an attractive, fully insulated gift box, and shipped via Overnight Courier. A personal message card, care instructions and floral preservative are also included. Show them your American Pride! This stunning bouquet consists of 6 Red Roses, 6 White Roses, 6 Blue Iris and Filler Greens. This bouquet is wrapped in decorative cellophane and carefully hand packed on ice in an attractive, fully insulated gift box, and shipped via Overnight Courier. A personalized card, floral preservative packets and rose care information are also included. Romance her with a burst of colors! This bouquet consists of 10 Assorted Alstroemeria and 6 Assorted Roses. This bouquet is wrapped in decorative cellophane and carefully hand packed on ice in an attractive, fully insulated gift box, and shipped via Overnight Courier. A personalized card, floral preservative packets and floral care information are also included. This exciting array of flowers consists of twenty stems of assorted Spray Roses (growers choice of colors) complemented with Leather Leaf greens. This bouquet is available for US Destinations only. This bouquet is wrapped in decorative cellophane and carefully hand packed on ice in an attractive, fully insulated gift box, and shipped via Overnight Courier. A personalized card, floral preservative packets and rose care information are also included. These greenhouse grown roses are shipped direct to the destination of your choice, virtually anywhere in the Continental United States and Canada. Modern technology combined with over 30 years experience has been utilized to produce roses that mature to magnificent full blooms and are among the finest available in North America. With this selection you receive one dozen elegantly wrapped Premium Long Stem Red Roses (22"-26") with Filler Greens, a personalized card, floral preservative packets and rose care information. Your order is wrapped in decorative cellophane and carefully hand packed on ice in an attractive, fully insulated gift box, and shipped via Overnight Courier. The colors of love, gratitude and heartfelt thanks abound in this charming mixture of Carnations, Alstroemeria, Roses, Larkspur, Asters, Monte Casino and other assorted fresh cut flowers and greens expertly combined in a crystal clear vase. Regardless of the occasion, your special someone will be thrilled by your heart felt emotional sentiment. Our florists use only the freshest flowers available so varieties and colors may vary.